This year’s edition gave evidence once again to the growing trend of wool being used in sports and outdoor wear. A large number of well known outdoor brands, product manufacturers, weavers and knitters as well as yarn spinners showcased wool on their stands. 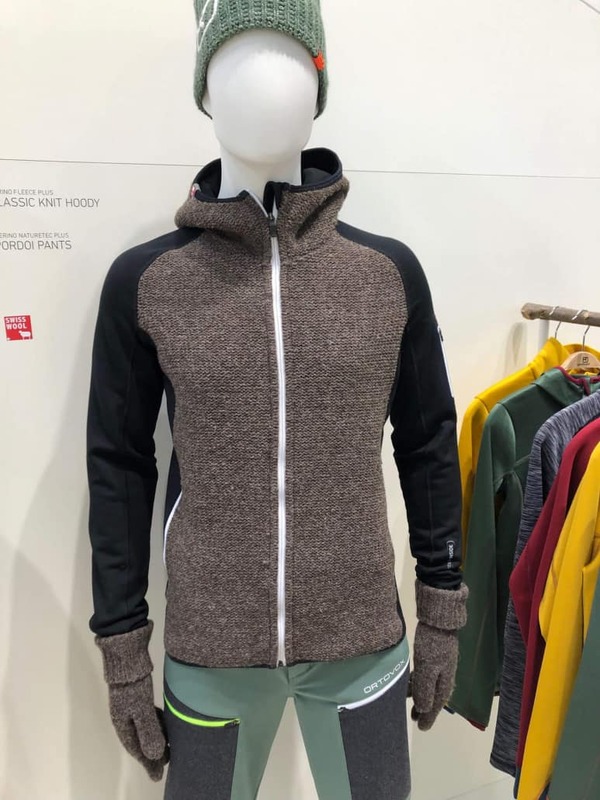 Besides the more traditional product applications of base layers, socks and beanies there were a few interesting wool trends being showcased worth mentioning. Wool wadding continues to be a success with brands offering outdoor and skiing garments. While a couple of years ago only a few brands offered wool wadded garments, the number of garments displayed this year has grown. Brands are experimenting with different weights of wool wadding, from very very lightweight to heavyweight and therefore creating different product applications. 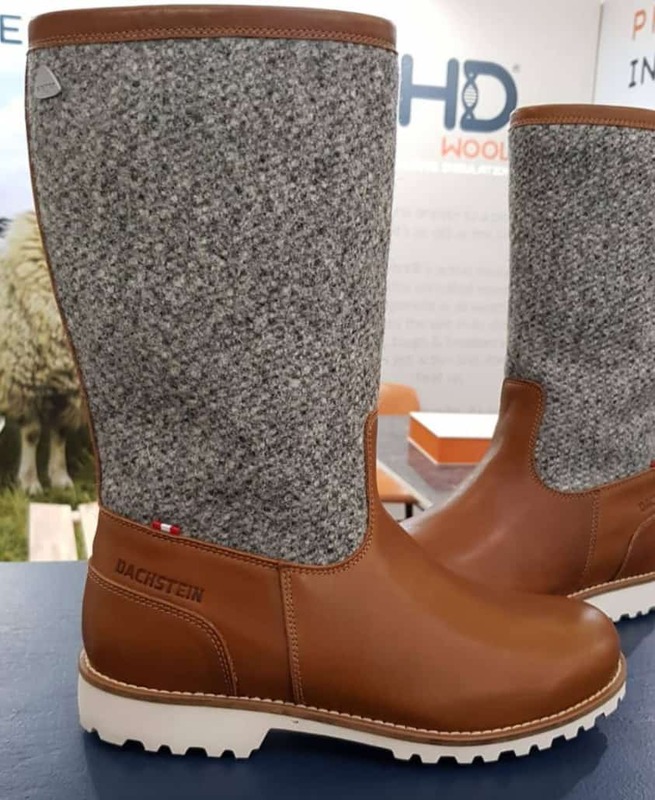 Austrian brand Dachstein exhibited a hiking boot filled with wool wadding while also using wool fabrics on the in and outside of the shoe. 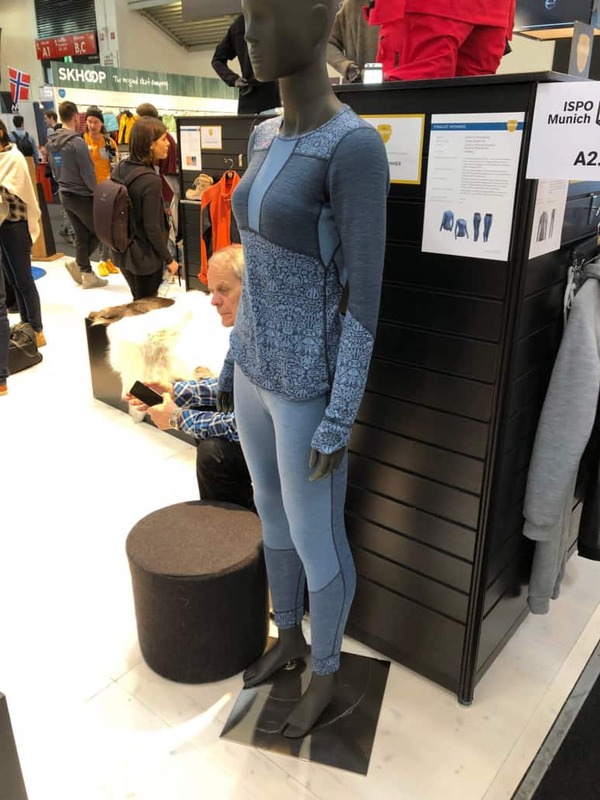 Another trend found at ISPO was that several brands showcased wool products made of local wools such as Norwegian, Swedish, Austrian or Swiss wool. These were either traditional sweaters or outdoor jackets filled with wool wadding. 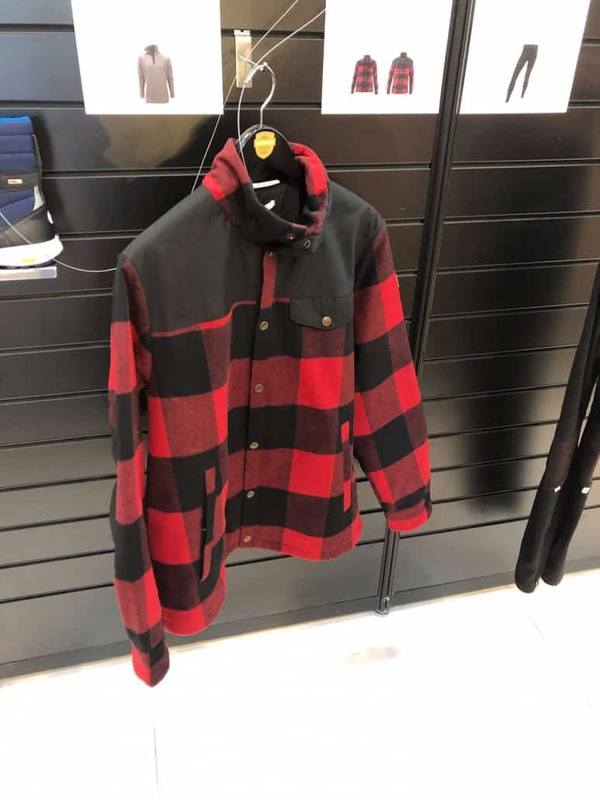 However, a few brands also showcased jackets that combined heavy knits made of local wool combined with outer layer elements. Every year there are several awards granted in different categories by the ISPO organisers. 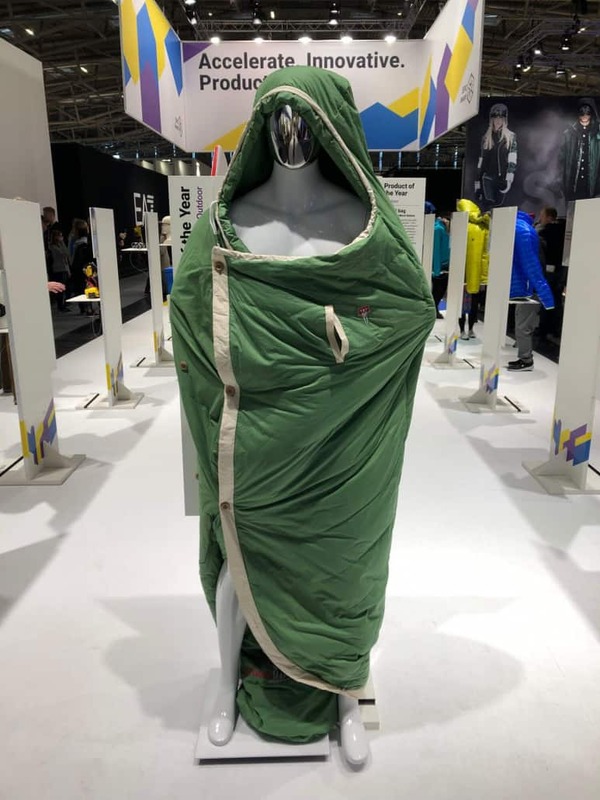 The ISPO best product award 2019 was given to the brand Grüezi bag for their sleeping bag Biopod DownWool Nature. The sleeping bag is made only out of natural materials. Lined with cotton, filled with a combination of 70% down and 30% wool and closing with wooden buttons. The sleeping bag can be used in a versatile way. 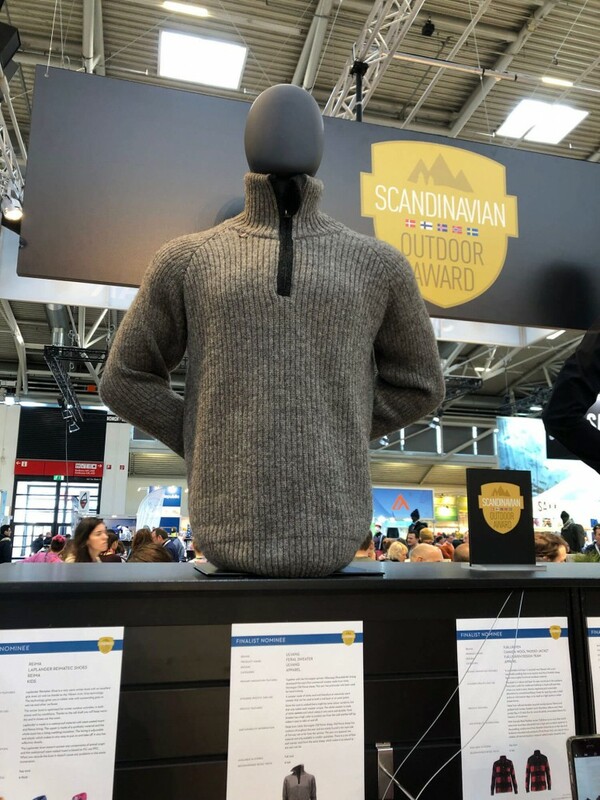 In another award offered by the Scandinavian Outdoor Group, wool was over-proportionally represented among the nominees as well as the winners. 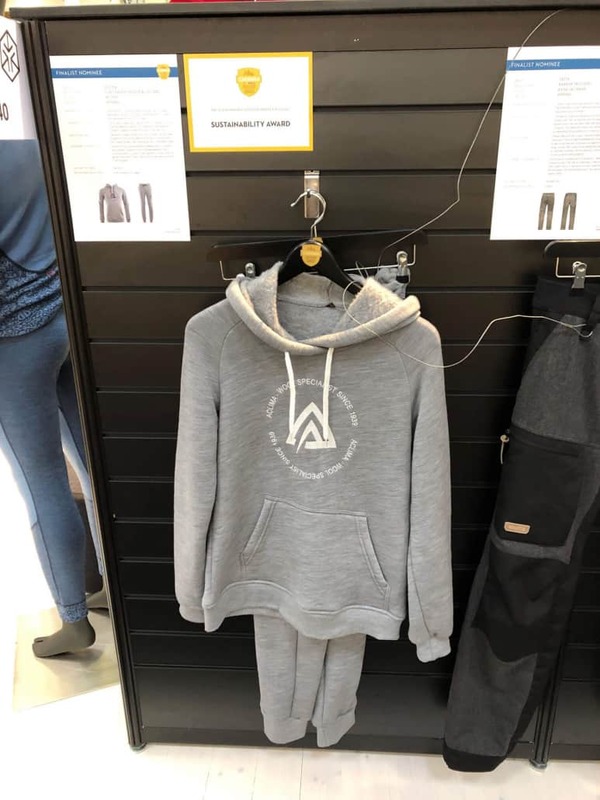 Devold’s reversible wool base layer won the best product award, while Aclima’s wool sweatsuit won the sustainability award. Other wool nominees included the recycled wool shirt by Ortovox. Sustainability continues to be an important topic at the fair as well. Many brands and suppliers showcased their sustainable products, fibres and solutions at the CSR booth in Hall A4. 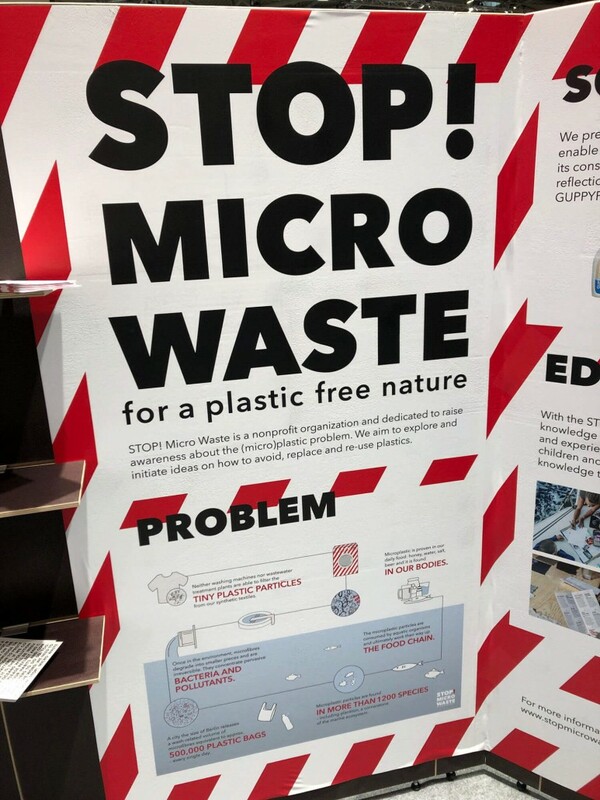 One theme of the CSR booth exhibition was biodegradation. 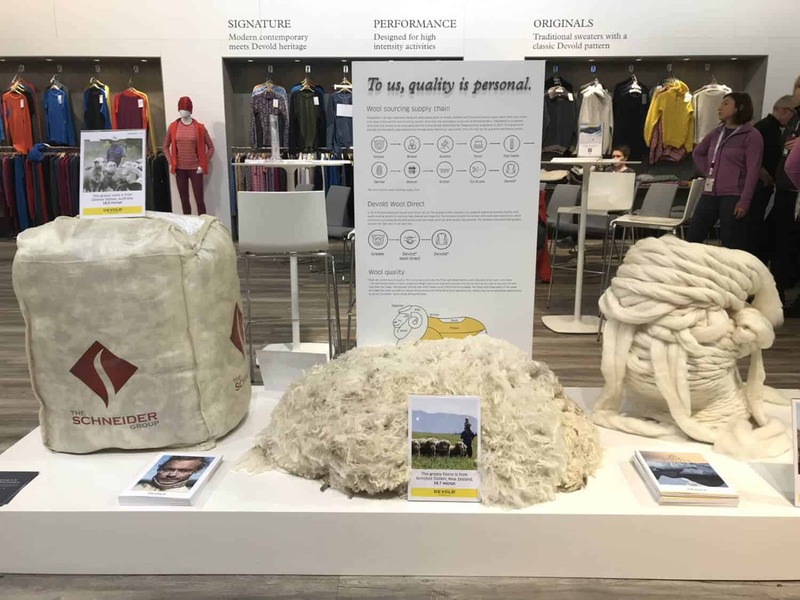 Exhibitors American Wool, HD Wool and The Südwolle Group offered displays on wool’s biodegradability. Plastic litter and microplastics harming the great outdoors and oceans were other topics that many brands and organisations communicated about. Overall, the topic of sustainability is an overarching theme and value for many brands and their products. Brands communicated their sustainability efforts tirelessly on their stands. Topics included the use of renewable, natural or recycled fibres, creating more versatile and longer lasting products or making the manufacturing process more efficient by reducing waste and water or energy consumption. Another topic that continues to be of importance to the sports and outdoor industry is traceability of wool from farm to shop. 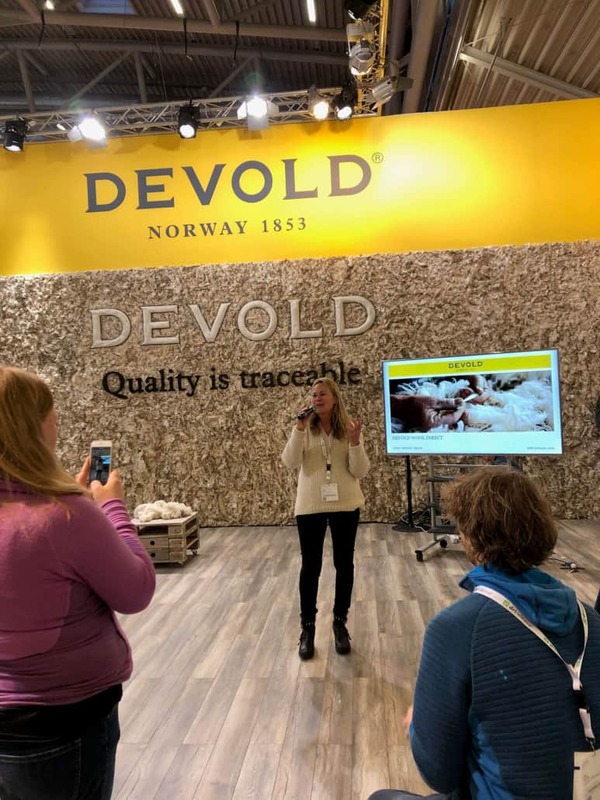 At a press conference held by Norwegian outdoor brand Devold, the company introduced its new venture Devold Wool Direct. 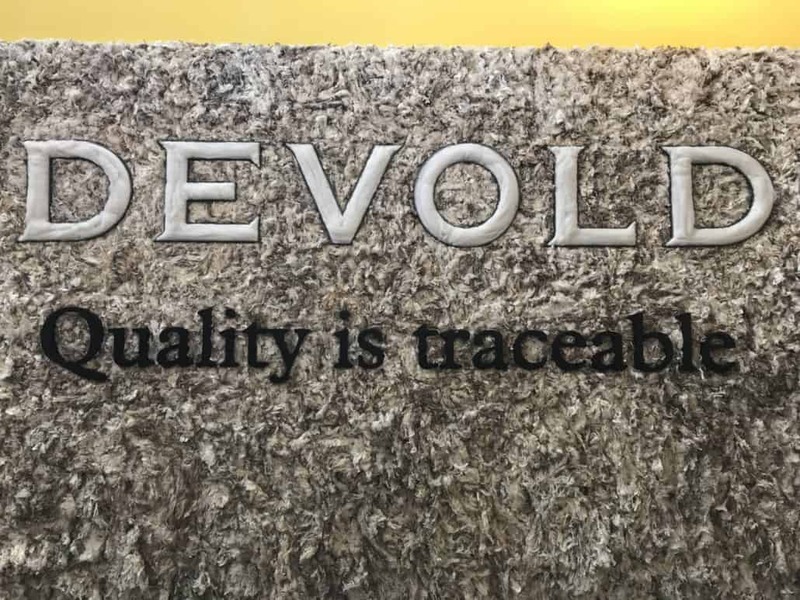 The new business entity sources wool for Devold through direct partnership contracts with wool growers in Australia, New Zealand and Argentina. This set up formalises their sheep to shop programme initiated in 2017 with the goal of creating a fully traceable and therefore transparent supply chain. Also, other companies, such as Baur Vliesstoffe is guaranteeing full traceability by extending their Swiss Wool label to other regions within Europe. On a more general note from the fair, topics such as digitisation, artificial intelligence and smart textiles were topics presented by exhibitors as well as topics discussed on different stages throughout the fair. Interestingly enough it became also clear at the fair that the more consumers need to adjust to a faster paste of life due to digitisation and other technological developments, the more they will long for and plan their escapes back to the great outdoors. The need to connect with nature will increase even further with our technological advances. At the same time, more than ever consumers are aware of the urgent need to protect the great outdoors through their own consumer behaviour. This is an important trend for wool to win and act upon.